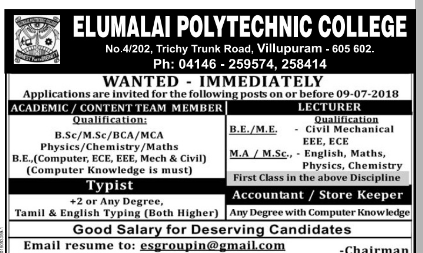 Elumalai Polytechnic College, Villupuram has advertised in the Dinamalar newspaper for recruitment of Teaching Faculty-Lecturer, Non Teaching Faculty jobs vacancies. Interested and eligible job aspirants are requested to apply on or before 09-07-2018. Check out further more details below. B.E,M.E, M. A, M.Sc First class needed for Lecturer. Content team member: B.Sc,M.Sc, BCA, MCA, physics, chemistry,maths, B.E(CSE, EEE, ECE, Mech, Civil) Computer Knowledge is must.